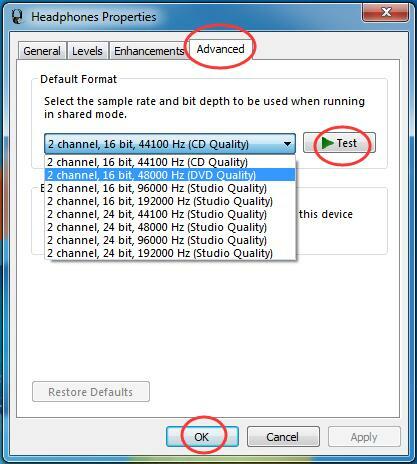 If you are facing a no sound issue on your Windows 7, this post is for you. Sound issues are common in Windows computer. Sometimes there could be the simple reason behind no sound issue like you have muted the sound on your PC or speakers or the audio wire between computer and speaker is not properly connected. Here, we offer six simple solutions that could resolve the issue. You don’t have to try all the solutions given here. The best approach would start with the first solution and try the next one in the list if the previous one has not worked for you and so on. All the above mentioned jacks are connected to sound processor on your motherboard. The speaker or sound system cable should be connected to line-out jack. If you are using a headphone without a mic, it should be plugged to line-out jack. After checking the connections, you need to also check whether the sound system is on (receiving power) and there are no other problems with the sound connection. Windows has an in-built sound troubleshooter tool that can fix sound related issues. Here are the steps to follow. Follow on-screen instructions to resolve the no sound issue. If the Microsoft Sound Troubleshooter fails to identify and fix the no sound issue, move to next solution. 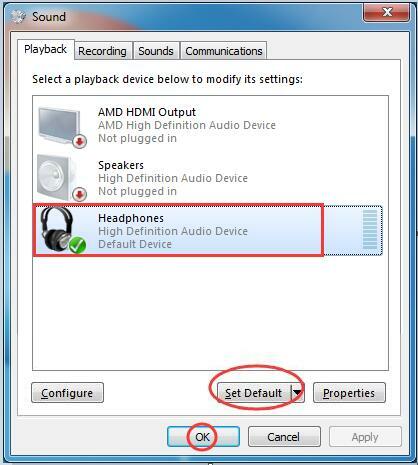 Windows has a default audio playback device which is primarily used for sound output. 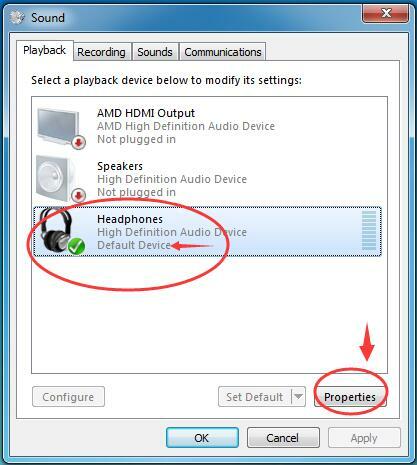 Your Windows computer can have several audio playback devices configured like headphones, speakers and other devices. When we say other devices we also point towards the sound cards installed in your computer that appear in the default audio playback device list. If any of the devices are removed or not connected at the moment or the current audio device is not set as default, it can lead to no sound problem. Hence, you need to check whether the right default sound device is selected. Here are the troubleshooting steps to follow. Windows supports various audio formats. Today, the audio files and video files support different audio formats like 16-bit at 48 KHz format, CD quality, DVD quality. There is a possibility your computer does not support the sampling and the bit rate of the audio or video file you are trying to play. In that case, your Windows computer may not be able to produce sound. To overcome this issue, you can try changing the audio format and see if it works. Here are the steps to follow. 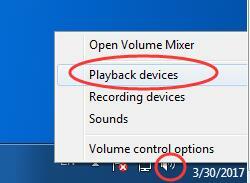 If the “no sound” issue is not resolved even after trying all audio formats in the list, move to the next solution. Your Windows computer has several advanced sound settings. If any of these settings have changed or wrong selections exist, it could lead to “no sound” issue. Sound enhancements refer to different sound effects that make the audio sound much rich. Some of the sound enhancements available in Windows 7 are Virtual Surround, Loudness Equalization, and many more. In this solution, we need to ensure the sound enhancements are not the cause of “no sound” issue. Here are the steps to follow. Play an audio or video file and see if the no sound problem is resolved. If the issue still persists, move to next solution. In many cases, corrupt or incompatible sound drivers are the cause behind “no sound” issue. In that case, reinstalling sound drivers seems to be an easy solution to resolve the no sound problem in windows 7. Play an audio or video file and see if the problem persists. If you see the no sound issue remains unresolved, you’ll have to update your sound card drivers. 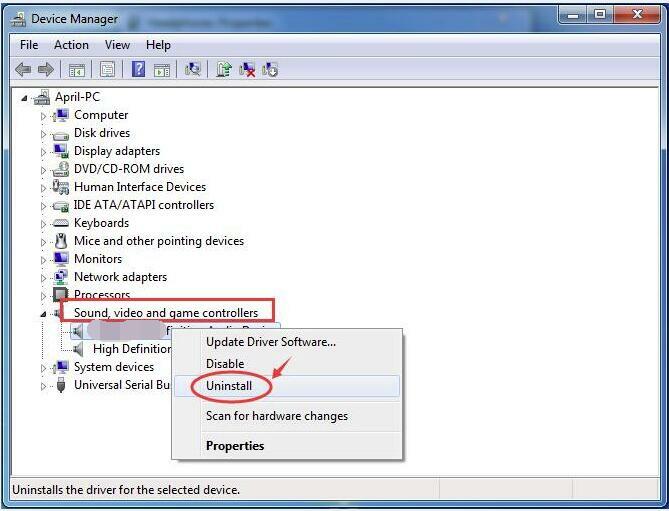 The best way to update sound device drivers, or any other device driver for that matter, is to use a fast, advanced driver update tool. You should consider using DriverDownloader because it is the best in the business. Simply click the green button below to download the software. Once you’ve downloaded the .exe file, double-click it to run the installation. Don’t forget to register DriverDownloader after installing it because only registered users get automatic driver updates.